The Olympic, Titanic's sister ship, received a distress signal from the stricken vessel on April 14, 1912, at 11 PM New York time. 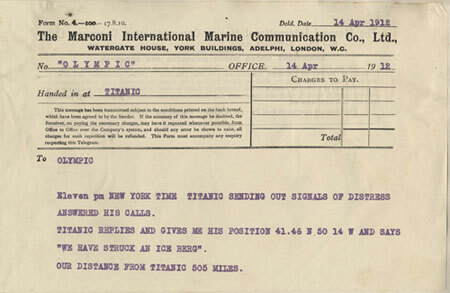 Among other things, Titanic's wireless operator told the Olympic: "We have struck an ice berg." The ship's location, at that moment, was reported as "41.46 N 50 14 W." Image of Marconigram online, courtesy National Museums Northern Ireland. I was awakened in my stateroom at 12 o’clock. The time, 12 o’clock, was noted on my watch, which was on my dresser, which I looked at promptly when I got up. At the same time, almost instantly, I heard the blowing off of steam, and the ship’s machinery seemed to stop. Did the Titanic keep steaming ahead - resuming her course - after she struck the iceberg? Did she stop and start again? Does that explain why there was a difference of 13 nautical miles from her first "CQD" (often, but wrongly, referred to as "Come quick danger") and her final resting place? At least one author, relying on the hearing transcripts and thirty years of research, believes so. By midnight, Captain Smith and Thomas Andrews knew the ship would sink. Five forward compartments had flooded. She could stay afloat with four flooded compartments, but not with five. The captain instructed Jack Phillips and Harold Bride to send urgent messages. They began with the customary "CQD," but their last transmission also used the new Morse distress call "SOS" (usually, but wrongly, referred to as "save our ship"). Captain Smith ordered the crew to lower the lifeboats. Both the captain and the designer knew, of course, there were not enough boats for everyone on board. And even though there were more than enough life jackets, the frigid North Atlantic would not be a place in which anyone could survive for very long. The Captain ordered Phillips and Bride to send urgent rescue messages. Both passengers and crew could see the lights of a ship off the port bow, perhaps 10-20 miles away. It was the Californian, stopped due to ice. Her wireless operator had shut down his system for the night. Despite repeated efforts to attract the vessel’s attention - including several distress rockets - the Titanic was never able to hail her. Some of the Californian’s crew saw a ship in the distance, but they did not learn of Titanic’s fate until 5 a.m. the next morning. By that time, Titanic’s passengers had been in the freezing water nearly three hours. Bos, Carole "A DOOMED SHIP" AwesomeStories.com. Mar 01, 2004. Apr 18, 2019. When Is “Being Close” not Enough to Make a Difference?